Matt spotted this in St Stephen NB. I guess they have a place where the coffee is so bad they can really only call it dark colored warm beverage, officially. That's ok coz I wasn't sure what I wanted to drink anyway. If this is coffee, take it back and bring me tea. If this is tea, take it back and bring me coffee. It's probably cocaine and weed sold as "coffee" or "tea". 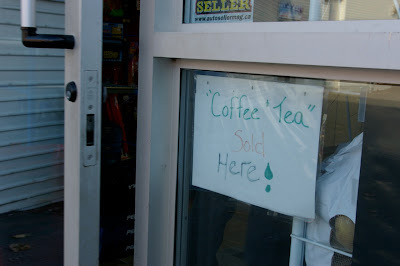 I have never seen more unnecessary quotations marks used than in St. Stephen, NB. Makes me wonder if there was one evil (or just dumb) elementary school teacher that had been corrupting the whole town with bad grammar for decades.